The actor bringing the hero to life, Jason Mamoa, is front and center in the teaser poster released by Warner Bros. Pictures and DC on Monday. His look hasn’t changed all that much since “Justice League”: shirtless, tattooed, and wielding what “Bats” called a pitchfork. In all honesty, can we still call it a “trident” if it has five prongs? Joking aside, this first glimpse at the character should go a long way toward building enthusiasm for the project. It’s a striking image with Mamoa wearing the menacing smirk he sported for most of the character’s cinematic debut in 2017. More importantly, the image seems to point to a grand scale epic adventure. 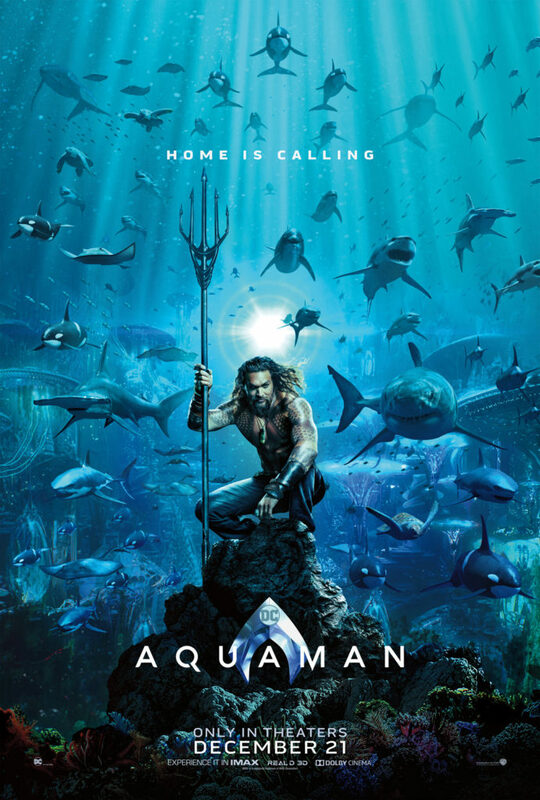 The catchphrase “Home is calling” points to the film exploring the character’s birthplace, its politics, intrigues, and Aquaman/Arthur Curry’s most familiar enemies. We know from previous casting announcements that “Aquaman” will also see the return of Amber Heard as Mera and feature the on-screen debut of Orm, Arthur’s half-brother, played by Patrick Wilson. We’ll no doubt get to see them in action in the trailer, set to drop on Saturday, July 22. What do you think? Are you more or less excited to see “Aquaman” after seeing this initial image?